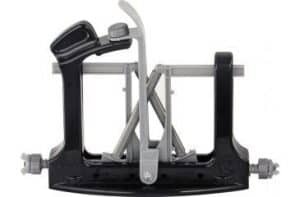 Warthog Knife Sharpeners are one of the most interesting series of products to hit the knife-sharpening arena in recent years. 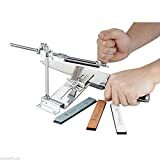 The company is relatively young, starting out in 1999 from South Africa, and since inception have striven to break the mold when it comes to traditional manual knife sharpening techniques. The warthog sharpening systems use a patented design, incorporating diamond blades for what is by general opinion a very superior, yet easy to use manual sharpening process. Demand has been high, with the fledgling business now exporting their V Sharp series of sharpeners all over the world. In the design process, Warthog attempted to create a system that replicated the precision that professional sharpeners were able to achieve, yet with a system that could be used by a novice in the home. This was their mission statement so to speak, and no mean feat by anyone’s standard. Their first attempt (released in 2000) was the V-Sharp™, and performed very well with critics and users alike. 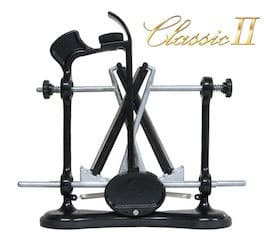 The product has subsequently been upgraded and updated, to their latest release the V-Sharp Classic II. Being Warthog’s first product entry, they attempted to accommodate a wide spectrum of potential users, the V Sharp being ideal for Kitchen, Fillet, Hunting and most other flat-blade knives. The major difference from the older models in the series is that Warthog have made the Classic II more aesthetically pleasing. With a hand crafted steel frame, solid rubber base and black powder coat finish, it’s durable somewhat industrial design looks great in modern kitchens. So much so, the popular sharpener has become Warthog’s flagship product since release. Designed with homeowners and campers in mind, the Warthog V-Sharp Curve is the easiest of the V-sharp series to use. 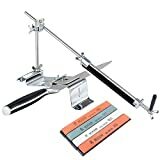 Ideal for any home kitchen, the sharpener is designed to be operated quickly and without any prior experience of manual knife sharpening techniques. (This ease of use makes it a good choice for campers too). Yet despite all of this, the tool delivers a really high quality standard of sharpening. The V-Sharp Curve contains non-adjustable rods that help ensure the blade is kept flat against the guide, (great for all the newbies out there). What’s more, the diamond rods are curved so that the blade edge maintains the 25-degree angle throughout the sharpening process. 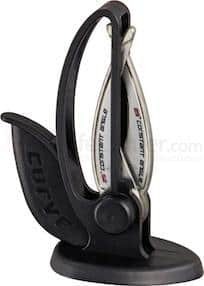 Add this to the spring loaded system that keeps an equal pressure on each side of the knife while the blade is pulled through, and you have a fool proof system easy enough for anyone to use. Clearly the non adjustable aspect of the product does mean that not all knives can be sharpened using the V-Sharp Curve. (For those needing a more versatile sharpener, the Classic II is therefore a better choice). The Warthog Extreme Edge is the manufacturer’s foray into sharpening systems suitable for Hunters, fisherman (and also Homeowners), making it ideal for Kitchen, Fillet, Hunting and most other flat-blade knife sharpening. Presentedin a smaller and more affordable package than the other sharpeners in the Warthog range, the Xtreme Edge™ is designed give you the perfect knife-edge while on the move, without damaging your knife. Unlike other budget sharpeners that are liable to shorten the life span of your blades, (by shaving off too much metal in the process of sharpening), the Xtreme Edge offers a professional sharpening performance by honing diagonally across the edge at a constant angle. This means that the system only shaves the necessary amount for your knives to regain their sharpness. The model boasts adjustable, freehand, sharpening, using two high quality 325 grit natural diamond honing rods. Again, sharpening is done simultaneously on both sides of the blade, (giving a fantastic even finish). Warthog state that the V-Sharp XE has not been designed to replace the V-Sharp Classic. The light-weight tool has been constructed to predominantly cater for those that need a sharpener whilst out in the field, making the Warthog Xtreme a great choice for any hunter or fisherman. Being completely waterproof the user does not have to worry about any rusting. The snap-in replacement rods make for very easy angle & grit changes. Depending on your knife, just snap out the rods, choose the desired angle and snap them back in again. Of course the small, economical design will appeal to kitchen users too, making the Xtreme edge another top selling knife sharpener from the Warthog company. High-Impact ABS Frame, Adjustable Blade Guide, 4 Quick Snap Angles, Slide-on diamond honers, Thumb Grip.